Newbury Racecourse is a racecourse and events venue in the civil parish of Greenham, adjoining the town of Newbury in Berkshire, England. It has courses for flat races and over jumps. 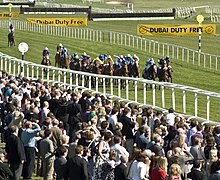 It hosts one of Great Britain's 36 annual Group 1 flat races, the Lockinge Stakes. The first recorded racing at Newbury took place in 1805 with "Newbury Races", an annual two-day race meeting at Enborne Heath. The meeting lasted until 1811 when it transferred to Woodhay Heath until 1815. In April 1904 the Newbury Racecourse Company was formed and purchased the land and then construction began of the buildings and stables at a cost of £57,240. On September 26 and 27, 1905 the first ever racemeeting took place at Newbury Racecourse with Copper King ridden by Charlie Trigg and trained by Charles Marnes winning the opening race, the Whatcombe Handicap. Marnes was presented with a Silver Cup (value £25) and Trigg received a gold mounted whip (value £10). It was fitting that John Porter trained Zelis to win the Regulation Plate on September 27 providing the only winner at Newbury for course’s founder as he retired from training at the end of the 1905 season. National Hunt racing followed shortly after Flat racing and in 1906, nine days racing were planned for Newbury in 1906 – six on the Flat and three over Jumps. A members badge which also covered the two days in 1905 was priced at 7 guineas. During the First World War Newbury Racecourse was used as a prisoner-of-war camp for German prisoners. Queen Elizabeth II spent her 86th birthday at Newbury Racecourse. She watched the races from the Royal Box although her two horses, Sequence ridden by Ryan Moore and Momentary ridden by Hayley Turner, did not win. On 14 August 2010, Irish vocal pop band Westlife held a concert for Where We Are Tour supporting their album Where We Are. Each year the racecourse hosts two music nights, with acts in recent years including: Jess Glynne, Olly Murs, Craig David and Rudimental. The racecourse has a dedicated railway station, which sees heavy traffic and additional trains on race days. It also acts as a venue for conferences, meetings, weddings and Hen and Stag parties. On 12 February 2011, two horses, Marching Song and Fenix Two, collapsed and died in the Paddock while parading for the first race of the day. Two others also appeared to have been affected, Kid Cassidy and The Merry Giant. The novice hurdle race went ahead, starting about 20 min late, but the rest of the day's racing was abandoned. On 17 February, the preliminary results of the investigation into the incident were released. Professor Tim Morris, Director of Equine Science and Welfare for the British Horseracing Authority, reported that they had been informed that there had been leakage from an electrical cable running under the parade ring. Both the horses had been examined postmortem and sudden cardiac arrest, consistent with accidental electrocution, had been identified as the cause of death and no other cause of death was further investigated. I can also confirm that, contrary to speculation, no evidence of any burn marks around the mouth was found on post mortem examination, neither were such marks found by the veterinary surgeons on the horses at the start. ^ "Corporate events, race sponsorship and venue hire at Newbury Racecourse". Newbury Racecourse. Archived from the original on 6 December 2008. Retrieved 12 February 2011. ^ "Electrocution blamed as two horses die at Newbury races". BBC Sport. 12 February 2011. Retrieved 12 February 2011. Wikimedia Commons has media related to Newbury Racecourse. This page was last edited on 19 March 2019, at 15:09 (UTC).